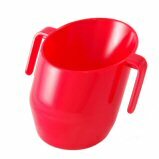 The Doidy Cup was scientifically designed with its unique slant to teach infants from a rim, not a spout. Using a Doidy Cup encourages good oral movements and helps develop chewing skills as the jaw, tongue and mouth muscles are used and infants find this movement perfectly natural, therefore it is so easy to wean them from breast to bottle. Our wee man (5 months) absolutely LOVES his new Doidy cup!! It is super easy for him to hold and doesnt spill! Fantastic design!! I was very skeptical that a 5 month old would be able to use a cup but I am so pleased with this 🙂 no bottles for this wee man YAY!! I’m so glad I was one of the lucky 5 chosen to review this cup. Arya (17 months) was watching eagerly as I took it from the packet and as I was reading the pamphlet that came with it, sneaky little hands were reaching to the table and grabbing it and running to the sink “more” she said and pointed at the tap…..her way of asking for water. I gave it a wash and pt some water in it and she was away. Because the shape of the cup is so different to anything else she is able to drink from it quite naturally and not a drop was spilled, quite miraculous!!! I wish I had it about 6+ months ago…..would have completely by-passed the whole sippy cup stage. 10 out of 10!!! My son loves his cup. He was so excited when it arrived and wanted to use it straight away. It is really easy for them to use.